I've mentioned the demand for money countless times in the 10-yr history of this blog, because it's a very important macro variable. The Fed controls the supply of money, but the demand for money is a function of a variety of factors, some of which are beyond the Fed's ability to control. The secret to any central bank's ability to deliver low and stable inflation is to keep the supply and demand for money in balance. For, as Milton Friedman taught us, inflation is always and everywhere a monetary phenomenon, and inflation results from an excess of money relative to the demand for it. It's that simple. Unfortunately, you don't see many people, including the Fed, talk about this. That's one of the things this blog brings to the table. For the first 9 of the 10 years I've been following it, the demand for money (which I define as the M2 money supply divided by nominal GDP) was in a secular uptrend: M2 growth exceeded nominal GDP growth. During this same period, inflation remained low and relatively stable. I interpreted this to mean that the world was in effect "hoarding" money, and that hoarding, in turn, was being driven by risk aversion and a general preference for caution and safety, leftovers from the monstrous shock to confidence that the Great Recession produced. Moreover, I thought the Fed was correctly responding to this money hoarding by rapidly and dramatically expanding the supply of bank reserves. You won't hear this same story from many others either. Towards the end of the Great Recession, the Fed adopted a radically new monetary policy which they dubbed Quantitative Easing (QE). Most people erroneously believed, and still believe, that the objective of QE was to stimulate the economy by printing money and otherwise making money cheap (i.e., by keeping interest rates low). I have argued in numerous posts that this was most definitely NOT the case. The purpose of QE was to accommodate the market's seemingly-insatiable demand for risk-free, liquid assets. Think of it this way: in the wake of the near-collapse of the global financial system, the world was desperate to acquire more T-bills, the gold standard for cash/money/safety. The demand for T-bills was so extreme that there were not enough in supply. Without enough safe liquidity to satisfy the demand for such, the financial system was in serious danger of imploding. The Fed solved this problem by buying trillions of dollars of notes and bonds and paying for them with bank reserves, which they also announced would for the first time ever begin to pay a risk-free rate of interest. Bank reserves, crucially, are not "money" that can be spent like dollars can. The banking system was happy to use strong inflows of savings deposits to invest in and hold all these new bank reserves, which had suddenly become a valuable asset, being risk-free and interest-bearing (just like T-bills). Banks were risk-averse too. In the end there was no "money-printing." QE essentially amounted to the Fed transmogrifying notes and bonds into T-bill substitutes. And it worked. Now that the crisis of confidence has finally passed, the Fed can safely reverse the QE process, because the demand for money is declining. There is nothing mysterious or sinister about this. In fact, if the Fed does NOT reverse QE, they would run the serious risk of allowing there to be too much money relative to the demand for it, and that would lead to a destabilization/devaluation of the dollar and an unwanted rise in inflation. Especially today, when all the evidence points to rising confidence, more optimism, and more risk-taking appetite. The demand for money is declining, and that fully justifies higher interest rates and a reduction in the Fed's balance sheet. Expect interest rates to continue to rise across the yield curve. Beginning about one year ago, the demand for money appears to have peaked, and it has since fallen by 1.9%. I take this as evidence that risk aversion and caution are giving way to risk-seeking. If I'm right, and this trend continues, this has profound implications for future economic growth and the conduct of monetary policy. 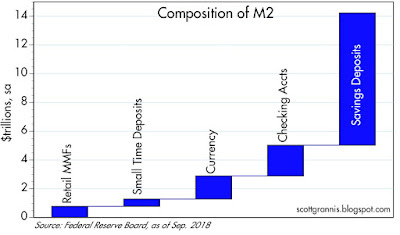 What this means in practice is that measures of "money," the classic being the M2 money supply, are likely to grow at a slower pace than nominal GDP for the foreseeable future. One dollar of money supply will be associated with an increase in total nominal output (and national income) of greater than one dollar. Put another way, a given amount of money will support a larger economy, as the velocity of money (the inverse of money demand) increases. The only way that people can reduce their holdings of money relative to other things is to spend it on something else, or invest it, such that the volume of transactions (akin to GDP) grows. Interest rates will continue to rise, and the economy will continue to grow, and inflation may rise as well, depending on how the Fed manages monetary policy. Many people will mistakenly worry that higher interest rates will kill the economy; they will be wrong, because higher interest rates will be a by-product of a stronger economy, more confidence, and more investment. The M2 measure of money supply is generally considered to be the best measure of "money." As Chart #1 shows, M2 consists of currency, checking accounts, bank savings deposits, and retail money market funds. The largest component by far is bank savings deposits, which grew from $4 trillion at the end of 2008 to now $9.2 trillion. 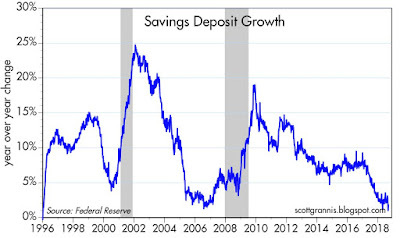 This is significant, because until recently bank savings deposits paid almost nothing in the way of interest. Yet people were happy to hold them because they offered safety and liquidity. The demand for this type of money was very strong, and that is evidence of the world's strong desire for safety in the wake of the Great Recession. 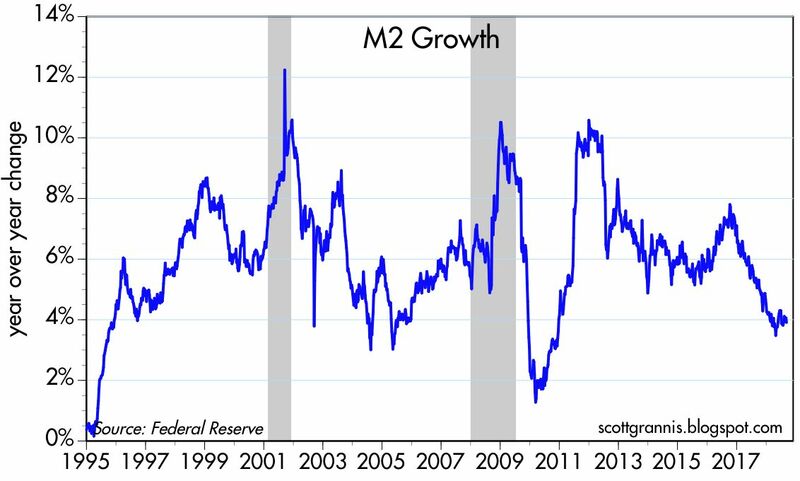 As Chart #2 shows, the growth rate of M2 has slowed significantly in the past year or so. 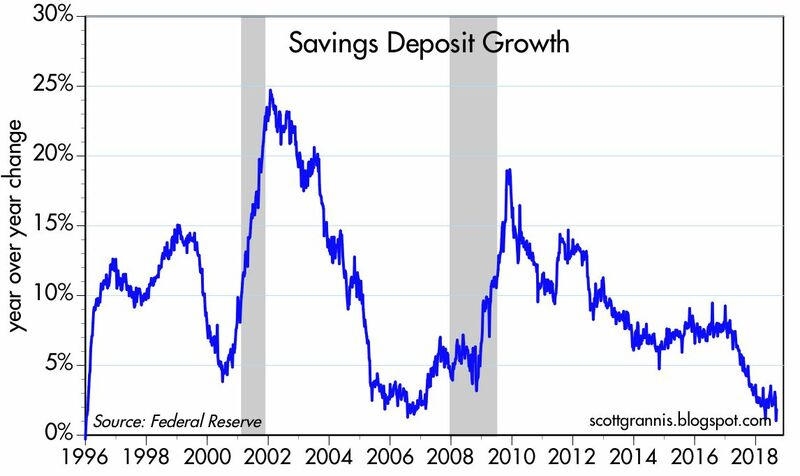 As Chart #3 shows, the main reason for the big slowdown in M2 growth is a big slowdown in its main component, savings deposits. This, despite the fact that banks have been increasing—albeit slowly—the interest rate they pay on deposits. Conclusion: the demand for safety has declined meaningfully in the past year or so. As Chart #4 shows, the growth rate of nominal GDP (shown in the blue bars) has picked up quite a bit in the past few years, even as the growth of money has declined. Chart #5 is the main exhibit. 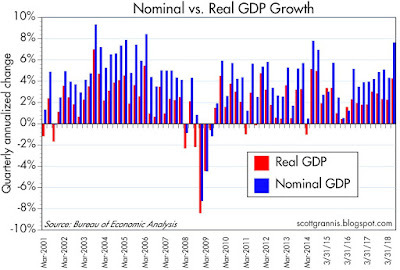 This shows the ratio of M2 to nominal GDP. To understand this chart, think of M2 as a proxy for the amount of cash (or equivalents) that the average person, company, or investor wants to hold at any given time. Think of GDP as a proxy for the average person's annual income. The ratio of the two is therefore a proxy for the percentage of the average person's or corporation's annual income that is desired to be held in safe and relatively liquid form (i.e., cash or cash equivalents). In times of uncertainty, it stands to reason that most people would want to hold more of their assets in cash, and in times of optimism they would want to hold less. The demand for money was extremely strong beginning with the Great Recession (2007), and it reached an all-time high a year or so ago. If it reverts to the levels which prevailed from 1959 through 1990, there is the potential for declining money demand (and increased risk-seeking) to generate potentially an extra $4 trillion of nominal GDP as people direct a greater portion of their income to expenditures and/or investments. 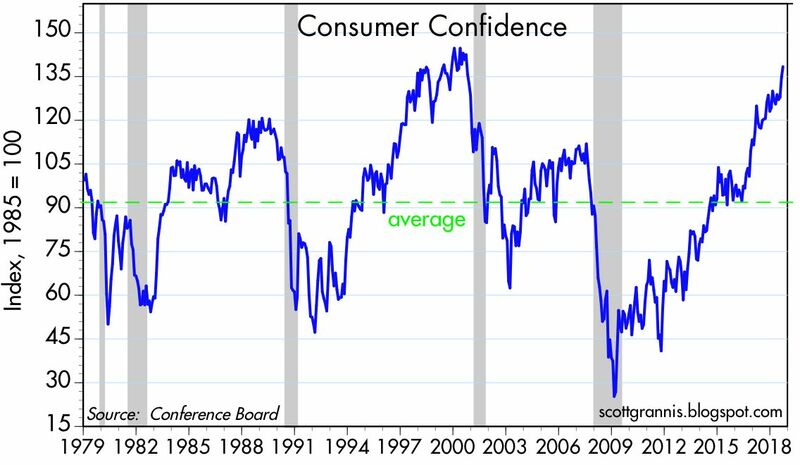 As Chart #6 shows, consumer confidence has surged since November 2016. With increased optimism naturally comes a reduced desire to accumulate cash, and an increased desire to spend money and/or invest it. There is every reason to believe that the demand for money will continue to decline. This all has very important implications for the Fed, because the Fed will need to take actions to offset the decline in the demand for money, or else it will risk igniting an unwanted increase in inflation. The Fed will need to raise short-term interest rates, and probably by more than the market currently expects (higher short-term rates have the effect of making savings deposits more attractive). The Fed will also need to continue to reduce the size of its balance sheet in order to reduce the supply of bank reserves as banks' demand for those reserves declines. This may cause the market consternation, but it will be exactly what is needed to ensure continued low and stable inflation and in turn a strong economy. Chart 5 is amazing. This scenario is so unique, it's abstractly fascinating to watch it unfold. And scary. If the Fed played their cards right up to this point, it will be nearly as critical to play it right unwinding. Very glad to have your insights for this - thank you! It's true that, like most news now, economic reporting is mostly garbage. I really enjoy reading your articles. Thank you for sharing and presenting your thoughts. "Transmogrify" - transform in a surprising or magical manner - is my word for the day. how can such high current money demand coexist with such high current consumer confidence? Scott, you have been 100% right in presenting the monetary picture for years, now. Im amazed at how many people misunderstand QE and the entire risk aversion scenario you present so simply and logically. Rates are gonna rise, and so are stocks as long as we keep restoring the rule of law, and America's greatness. If socialists retake Congress, risk aversion will return, and animal spirits will subside. Thank you for this excellent blog. This is one of the best performance years of my career. Your common sense and logical explanations over the past decade have definitely helped make that possible. Chart #6 is what caught my attention. 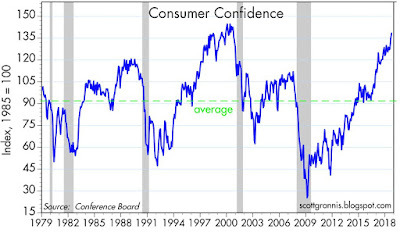 Consumer confidence has been on a one-way trip to the moon, and has now arrived there. History indicates that it won't stay at these levels for long. Since housing is the business cycle.....How do u think higher rates affect the housing market this time? It would seem like this time it's differnt cause we've been so low for so long ? A couple decades of very tight labor markets is the tonic that the American economy and democracy need. Very interesting. If your forecast plays out as anticipated, which asset classes should do best in this scenario? Scott, Thanks again for your excellent analysis. Does this imply that foreign money demand is also decreasing, or just domestic? Is it possible foreign money demand would keep int/long term rates low while the fed raises ST rates? This is brilliant. As part of this wouldn't it make sense that the Fed continue to increase the IOER rate at a slower pace than the Fed Fund target rate? Then banks will have less and less of an incentive to leave excess reserves at the Fed -- thereby reducing the balance sheet. When the Fed writes the check by buying mortgage backed securities, the government sector owns interest bearing securities and the private sector owns Fed IOUs that earn nothing. So, each year, the Fed writes a check to the Treasury in the billions of dollars from the interest they earned on those bonds effectively taking that money out of the private sector. Then, when the Fed sells those securities back to the private sector, the Fed gets back its zero interest reserves and gives the private sector the bonds that pay interest. Re: "how can such high current money demand coexist with such high current consumer confidence?" The point of this post is that it very likely can't continue. 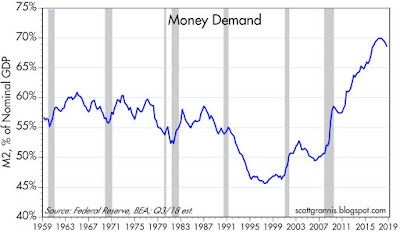 Money demand is high, but it is declining, and will likely continue to decline for the foreseeable future, barring some unexpected and massive negative shock, of course. Re "Given rising interest rates and the strong dollar, what are your expectations for dollar denominated emerging market debt?" A few observations: 1) the dollar is strong, but not excessively strong. Not nearly as strong as when the last emerging market crisis happened in the early 2000s. 2) interest rates are rising, but in real terms they are still quite low. Way lower today than they were in the early 2000s. With today's funds hike to 2.25%, the Fed is just beginning to get the real funds rate into positive territory (inflation is running a little above 2%). The Fed is nowhere near tight. Commodities have been weak for the past year, but they are still way above where they were in the early 2000s. So emerging market economies are not being battered nearly as much today as they were back in the early 2000s. Gold, for example, is $1200 today, whereas in late 1999 it was $260. Times are tough, especially in Argentina, but it's not impossible for them to recover. Things aren't that bad. Already I see signs that EM debt prices are bottoming. Re "How do u think higher rates affect the housing market this time?" I had a post not too long ago that argued that the housing market was consolidating, not collapsing. With mortgage rates almost sure to increase further, and with incomes still increasing only modestly, I think housing prices are going to increase modestly at best. Affordability is becoming an issue. Rising interest rates are a headwind, but a stronger economy, rising employment, and rising incomes are nevertheless a respectable tailwind. Re "If your forecast plays out as anticipated, which asset classes should do best in this scenario?" I think equity prices will continue to rise, but certainly not as fast as they have in recent years. I would say that equity prices are moving into "fair value" territory. Not much low-hanging fruit out there. But still, if the economy grows at 3-4% it's going to be hard to resist owning a piece of the action (i.e., equities). And of course earnings yields are still comfortably above risk-free yields, so equities are attractive even if earnings don't grow much more. Emerging markets are the cheapest asset class right now. If they can overcome their difficulties they have tremendous upside potential. A strong global economy can do wonders for the laggards if the laggards just get their act together. All Argentina has to do, for example, is just stop increasing its money supply by 45-50% a year. That would immediately strengthen the peso and bring back the many billions of flight capital that have left in the past several months. Re "Does this imply that foreign money demand is also decreasing, or just domestic? Is it possible foreign money demand would keep int/long term rates low while the fed raises ST rates?" I haven't really tried to pin down the impact of foreign money demand on our markets. It's important to note that money demand really only applies to assets that are generally safe, liquid, and whose yields are tied to the front end of the yield curve. Bonds are a different animal. In general, I would say that foreigners are subject to the same fears that we are. But there is certainly a lot of global demand for T-bills and dollar currency. Re "wouldn't it make sense that the Fed continue to increase the IOER rate at a slower pace than the Fed Fund target rate? Then banks will have less and less of an incentive to leave excess reserves at the Fed -- thereby reducing the balance sheet." No. The reason the Fed will need to keep increasing the funds rate and the IOER rate is to keep banks from deciding that they should view excess reserves as an inferior asset. If banks decided tomorrow that the almost $2 trillion of excess reserves they are holding are much less attractive, on a risk-adjusted basis, than making loans to the private sector, then with so many excess reserves banks could begin lending--and creating money in the process--in a prodigious fashion, and this could cause a real inflation problem. The Fed wants banks to continue to hold reserves because of their inherent attractiveness. Meanwhile the Fed can sell its note and bond assets to banks gradually, receiving bank reserves in payment, which would in turn shrink the Fed's balance sheet and reduce the amount of excess reserves that banks might want to use to support too much lending. Re: Re: "how can such high current money demand coexist with such high current consumer confidence?" The point of this post is that it very likely can't continue. 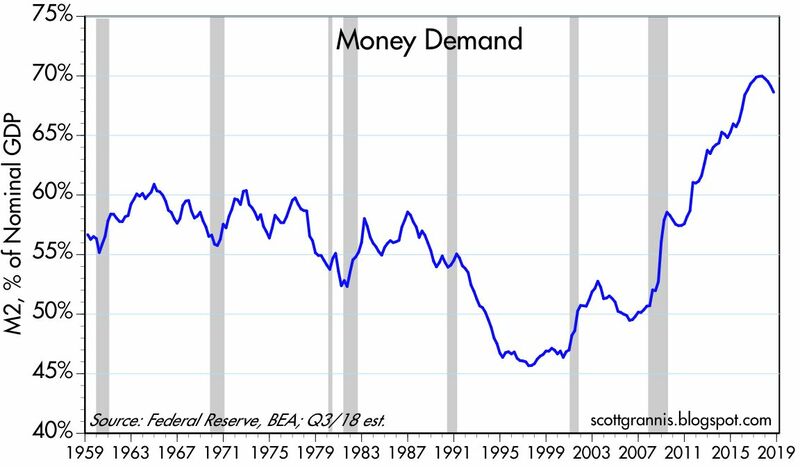 Money demand is high, but it is declining, and will likely continue to decline for the foreseeable future, barring some unexpected and massive negative shock, of course. Scott: thanks for reply. I understood the point you were making and I guess I was a bit too brief; there is a very long (9 years) and significant (>400% growth) in the rise of consumer confidence, and for this entire period, money demand has increased with two rather insignificant declines (the current one being the tell perhaps for the forward looking point of your post). my only point is that either you are right and asset prices should do very well for short to medium term (barring exogenous shock) or there has been a cultural/attitudinal shift. this shift would entail that confidence is compatible with a higher degree of risk aversion than one would predict. thanks for post and please update charts 5 and 6 as we go. Okay into 2008 there was hellacious demand for safe assets, especially US Treasuries. The Fed solved this shortage of safe assets by problem by...buying several trillion dollars of US Treasuries and taking them off the market. Huh? And then the Fed gave to commercial banks reserves which were not intended to be lent out, so the Fed invented the interest on reserves program which is a lot like paying farmers not to grow crops. Why did not the Fed merely buy Treasuries directly from the public, by opening up its own open-market desk? As it stands the Fed can only buy treasuries from the 22 authorized broker-dealers, who deposit receipts into commercial banks. However, through a little discussed program, the Fed actually lent the primary dealers the money by which they bought US treasuries on the open market. My head is spinning when I try to understand this. There seems to be as many explanations of quantitative easing, and what it accomplished, as there are economists, and all spoken with great conviction. After reading about quantitative easing for 10 years, I have decided to take up gardening as my next hobby. Benjamin, I totally agree with you that economics is a "dark science" if science at all. It's always amazed me at how a group of extremely well educated individuals can look at exactly the SAME data and ideate completely disparate conclusions! That said, for my money, Scott is the man. 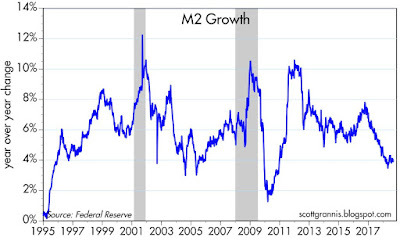 What's the mechanics behind chart #5 - How does M2 grow slower than GDP to get that line to fall? Does it imply an increasing capital spend with increasing productivity to drive GDP higher? Otherwise cash just coming out from bank accounts to buy equitues has no net impact on M2 or GDP? Or is there some link between debt levels and the ratio of M2 to GDP? Would QE have worked if the FED had not contemporaneously robbed savers and retirees of their risk-free interest and dividend payments...in May 2007 I had a tax-free jumbo muni money market account stop paying dividends all together...where did that money go? the answer "The Fed solved this problem by buying trillions of dollars of notes and bonds...,which they also announced would for the first time ever begin to pay a risk-free rate of interest. "...that my friend is how moral hazard is created...change the rules at the most crucial moments of the game in favor of those who should have lost due to their own petard. Re "Would QE have worked if the FED had not contemporaneously robbed savers and retirees of their risk-free interest and dividend payments"
I sympathize with those whose cash savings earned very little if any interest during the Fed's QE program. But as I have argued, the Fed didn't arbitrarily reduce interest rates to near-zero. The Fed was following the market. The market itself drove rates to zero, since the world's desire to hold cash-like instruments was intense. When the interest rate on any interest-bearing instrument approaches zero, the price of that instrument moves to a very high level. The world was willing to pay a lot for the safety of cash, and that demand drove the yield on cash to zero. The Fed didn't change the rules. The Fed responded to extremely strong demand for cash-like instruments by creating more bank reserves, which were effectively T-bill substitutes. The banks gobbled them up, despite their extremely low yield. Scott, thanks for the response...what had me scratching my head was that my money market at the time was Fidelity's jumbo muni money market paying 3.7% tax exempt...I didn't realize the FED could intercept the risk free returns from municipal bonds approaching maturity...I thought they controlled the fed fund rates only...boy was I wrong. The Fed doesn't actually intercept or control muni yields. But when the Fed funds rate drops to near-zero, all other short-term yields have to decline as well. The Fed funds rate and the Treasury yield curve form the backbone (or the reference point) for all yields. Arbitrage keeps things in line.